Christian Plessl is professor for High-Performance IT Systems at the department of Computer Science at the Paderborn University and the director of the Paderborn Center for Parallel Computing (PC²). He earned a PhD degree (Dr. sc. ETH) in Computer Engineering from ETH Zurich in 2006, and a MSc degree in Electrical Engineering in 2001, also from ETH Zurich. Before his appointment as professor in 2015, he held an assistant professor position at Paderborn University, and a postdoc position at ETH Zurich. Dr. Plessl has been involved with several national and transnational research projects. 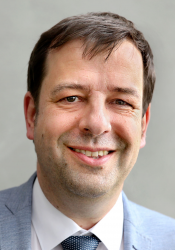 Currently, he is principal investigator (PI) in the DFG project PerficienCC, PI and coordinator of the BMBF project HighPerMeshes and subproject leader in the DFG collaborative research center SFB901 On-The-Fly Computing. Previously, he has participated in several national and trans-national research projects funded by the German Research Foundation (DFG), the German Ministry of Education and Research (BMBF), and the European Commission. His research has also received support from industry, for example, by grants from Intel, Fujitsu, Xilinx, Altera, and others. Dr. Plessl is author and co-author of more than 70 peer-reviewed publications and his research has been honored with several awards, e.g., the significant paper award 2015 of FPL conference, the best paper awards at ReConFig 2014 and 2012, the Paderborn University Research Award 2009, and the SEW-EURODRIVE Studienpreis award in 2001. He is a senior member of the IEEE and the HiPEAC Network of Excellence. He is a regular reviewer for scientific journals and serves on the program committee of major international conferences. His research interests include architecture and tools for high-performance parallel and reconfigurable computing, hardware-software codesign, and adaptive computing systems.